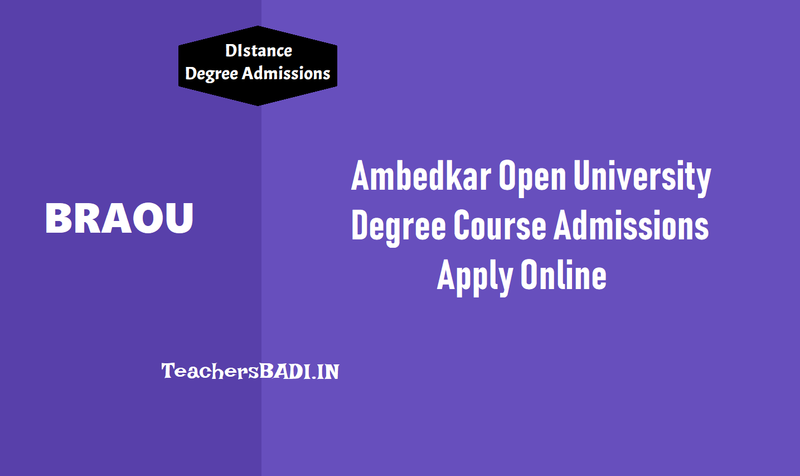 UG(B.A,B.Com,B.Sc) Online Admissions 2018: Dr BR Ambedkar Open University has announced the Direct BA/BCom/BSc Admissions 2018-2019 notification and University is inviting online applications from the eligible candidates( Inter passed / Eligibility test passed) for admission into BA/BCom/BSc courses for 2018-2019. Applications will be received from June 29 for BA/BCom/BSc Admissions 2018-2019. Those who have Inter or equivalent students and the Candidates who have passed E.T. 2018 are eligible. Apart from these, those who are part of the Telangana Open School Society and AP Open School Society can apply directly. Eligible Candidates of Andhra Pradesh and Telangana can apply through online mode only. The fee should be paid in the TS / AP online. Other details are suggested to be on the university website or at the university portal. The last date for submission of applications without any penalty is (see below dates). అంబేడ్కర్‌లో డిగ్రీ, పీజీ కోర్సుల ప్రవేశానికి గడువు పూర్తి: డాక్టర్‌ బీఆర్‌ అంబేడ్కర్‌ సార్వత్రిక విశ్వవిద్యాలయంలో డిగ్రీ (బీఏ/బీకాం/బీఎస్సీ), పీజీ (ఎంఏ, ఎంకాంం, ఎంఎస్సీ, ఎంబిఏ), బీఎస్‌ఐఎస్‌సీ, ఎంఎల్‌ఐఎస్‌సీ, పీజీ డిప్లొమా, పలు సర్టిఫికెట్‌ కోర్సుల్లో చేరడానికి అక్టోబరు 20 (శనివారం)తో గడువు పూర్తికానుంది. ఈ మేరకు విశ్వవిద్యాలయ వర్గాలు ఓ ప్రకటనలో తెలిపాయి. విద్యార్హతలు, రుసుము తదితర వివరాలను వెబ్‌సైట్‌లో పొందుపర్చామని.. మరిన్ని వివరాలకు 7382929570/580/590/600 నంబర్లలో సంప్రదించవచ్చని సూచించారు. Dr. B.R. Ambedkar University issued the UG Eligibility Test 2018 notification in the month December 2016 and University officials is inviting online applications from above said eligible candidates for admission into B.A./B.Com/B.Sc programme into their study centres for the academic year 2018-2019. Eligible candidates are applying the ET stream and appeared for Eligibility Test 2018 which would be conducted in the month of February 2018. Now Dr. B.R. Ambedkar University officials will issue the three year Under Graduate programme admission notification 2018. BRAOU officials invites the online applications from the eligible candidates for admission into 3 year degree programme for the year 2018-2019. Online Admission Form For Intermediate/Polytechnic/2 years ITI Candidates & ET Passed (2014-2017) and Online Admission Form For Eligibility Test 2018 Passed Candidates are opened now..
3. The Candidates who have passed E.T. 2018 passed or E.T. 2014 to 2018 passed are eligible for admission into UG programmes.